While you still have a few days to figure out what you are going to wear for Saturday’s huge Red River Showdown between the Texas Longhorns and Oklahoma Sooners, UT has already got their uniforms picked out. 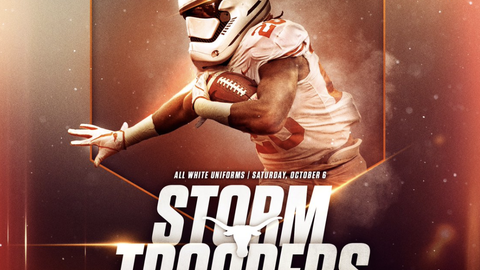 Texas tweeted out on Tuesday the color combination the Longhorns will take the field at the Cotton Bowl in on Saturday, choosing to go with “Storm Trooper” layout of white helmets, white tops and white pants. We are still waiting to hear what the Sooners will wear. The annual Red River Showdown game in Dallas at the Cotton Bowl between the Longhorns and Sooners kicks off at 11am on FOX.